I know … we have seen a million photos like this, but it can’t be helped ~ Cinque Terre, with its five colourful sea villages nestled into the Italian northwest coast is simply one of the most charming areas to be found anywhere. 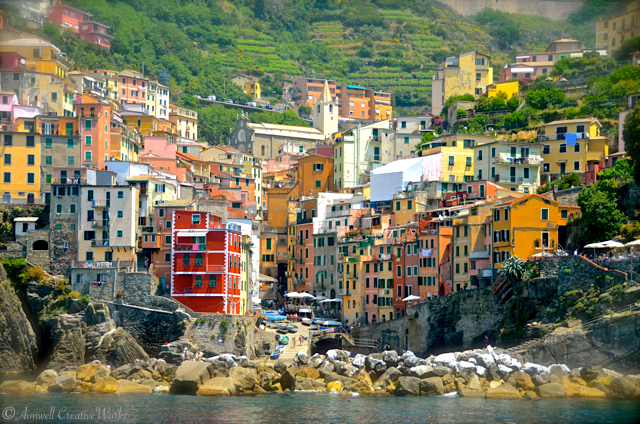 This image shows Riomaggiore as we passed by on a boat ride which started in Monterosso. We stopped in Vernazza for gelato (go figure! ), and in Portovenere for lunch, before heading back by boat again to Monterosso. Meanwhile, I held my own. Careful not to overwhelm my recovering adrenal system, I remained low key. Still, I enjoyed the opportunity to be out on the water with our friends and to enjoy the pretty coastline. 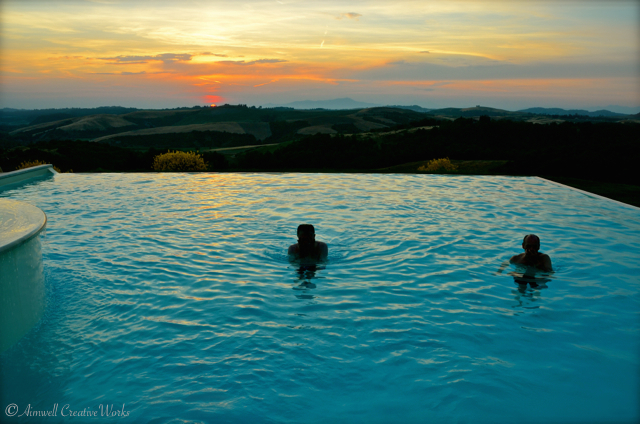 After the two-and-a-half hour drive back to the villa we happily hit the infinity pool and cooled down as the setting sun disappeared behind Tuscan hills. This entry was posted in Italy, Photography, Travel and tagged Aimwell CreativeWorks, cinque terre, Dorothy Chiotti, Italy, Photography, Travel, Tuscany, water. Bookmark the permalink. What an amazing setting for the villa! Where did you stay?! Italy beautiful place where i ‘will like to go one day !! nice shot! I hope you make it there. So beautiful! One of the places in Italy I’ve always wanted to go. I do think you have experienced enough gelato to write a nice blog post on the subject, Dorothy! 🙂 Beautiful photos, as always. Great photos! Cinque Terre looks nice through your lens! I tried to take some nice photos during my visit but I reckon it’s greatly affected by the daylight. Feel free to visit my site and give me some feedback https://lifeofaminion.wordpress.com Thanks!